Smallpox vaccination team in Afghanistan. Five Peace Corps volunteers leaving Kandahar, Afghanistan on their way to vaccinate people in remote villages. 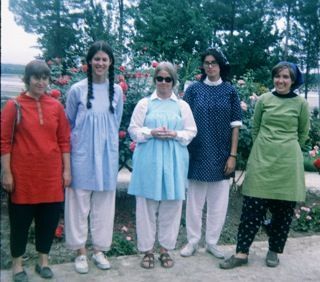 From left to right: Maggie Eccles, Rita Hackett, Lynn La Froth, Carol Crawford-Omar, Barbara Runyan. Photographer unknown., “VACCINATION TEAM,” The Global Health Chronicles, accessed April 23, 2019, https://globalhealthchronicles.org/items/show/5371.